Our six week cooking class series is offered for free to participants in communities facing health disparities. The curriculum and class structure is based on social cognitive theory which emphasizes a multi-pronged approach to teaching and behavior change, such as active, hands on learning, social support, homework and peer modeling. Each week, the class meets for an hour and half to cook, discuss and learn together. The Happy Kitchen/La Cocina Alegre® uses trained peer Facilitators to deliver its cooking classes and workshops throughout the community. The majority of Facilitators were The Happy Kitchen/La Cocina Alegre® participants who wanted to become more involved with the Program. This model is based on the Public Health “Promotora” model and enables experienced Facilitators to further their involvement with the Program while also developing invaluable leadership skills. Provides groceries to participants after classes one through five so that they may go home and practice their cooking skills and share the dish with their family. Places emphasis on local, seasonal and cultural appropriate foods. Integrates food systems concepts into its curriculum such as shopping at farmers’ markets and growing one’s own food. Promotes skills and self-sufficiency in preparing healthy, economical meals that consist of whole grains, fresh produce and low-saturated fat ingredients. The class series emphasizes the selection and preparation of fresh, seasonal foods that are nutritious, affordable, and delicious. 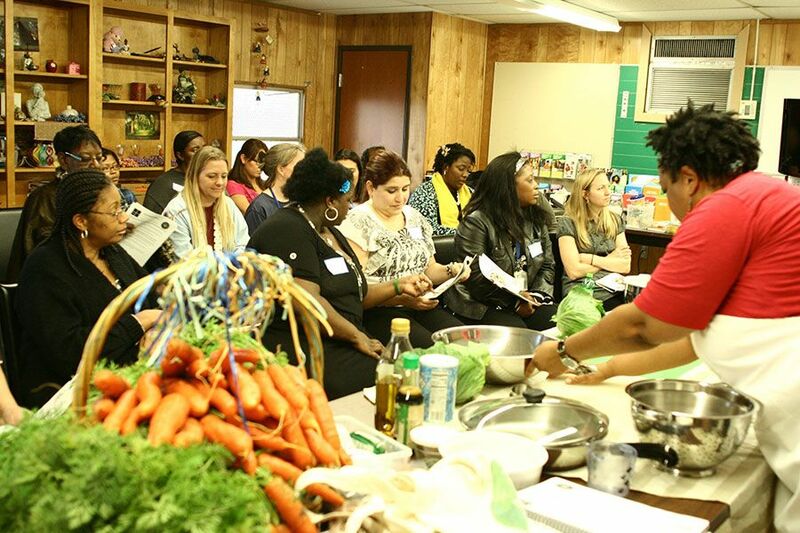 These grant-funded classes are free for participants, and are offered in specific communities in Austin for individuals who are low-income or at high risk for diet-related disease. To find out more about attending a class or about bringing a six week class series to a particular community, please email or call us.